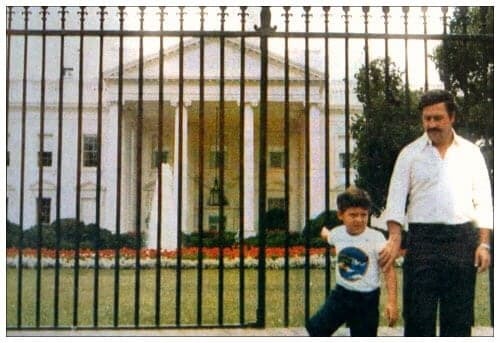 In a bizarre photograph the drug kingpin Pablo Escobar was photographed standing in front of the gate that surrounds the White House. The photo was taken in the early 1980s. He is standing by his young son who is dressed casually in a t-shirt and black pants, while Escobar has on a white dress shirt, black pants and a watch on his wrist while he rests a hand on his son’s shoulder. It looks like they were taking a trip as any tourist would if they made a stop by the White House, so it may not be seen often because it is just a family photo while on a vacation.